one year. Candidates interested for Trade Apprentices vacancies may go through CPCL official website www.cpcl.co.in. Online application link opens from 30-07-2018 to 12-08-2018. Candidates are advised to read the instructions to fill the application. Candidate should have minimum age limit of 18 years and maximum age limit is 24 years as on 01-07-2018. Selection of candidates for CPCL recruitment is based on their marks percentage in respective ITI trades/ Degree and followed by Documents verification/ Medical fitness test. 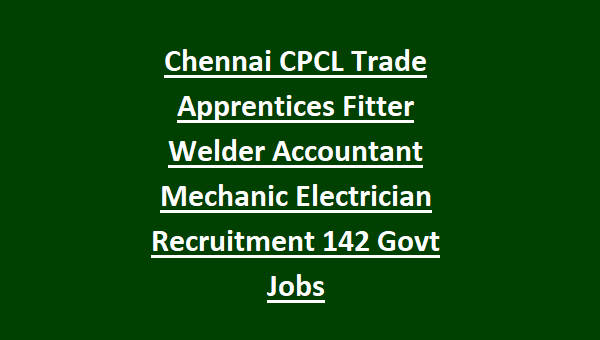 Monthly Stipend for CPCL Recruitment Trade Apprentices Jobs is Rs. 8625/-. For more details of Chennai Petroleum Corporation Limited CPCL Trade Apprentices Recruitment vacancy, Eligibility Criteria, Qualifications, Age limit, Monthly Stipend, Application Procedure related information are given below. 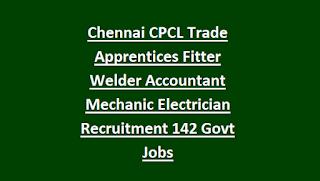 Total available Trade Apprentices vacancies in Chennai Petroleum Corporation Limited CPCL Recruitment are 142 posts. Post Name: Trade Apprentices: 142 posts. Minimum age limit is 18 years and maximum age limit is 24 years as on 01-07-2018. Age relaxation for SC/ ST candidates is 05 years and 3 years for OBC candidates. Age will be relaxed for PwD general candidates is 10 years, for PwD OBC candidates is 13 years and PwD SC/ ST candidates is 15 years. Candidates must have passed 10th class/ 12th class examination under 10+2 system or equivalent examination with Diploma/ ITI in relevant trade with 50% minimum marks for general candidates and 45 % marks for SC/ ST/ PwD candidates. Selection of candidates for CPCL recruitment is based on their marks percentage in respective ITI trades/ Degree. Shortlisted candidates will be sent to the documents verification and Medical Fitness Test. Candidates willing to apply for Apprentices Training in CPCL Recruitment may apply through online using the official website of Chennai Petroleum Corporation Limited www.cpcl.co.in. Read the advertisement carefully and fill the application form. Application submission starts from 30-07-2018 to 12-08-2018. 3. Mechanic Motor Vehicle (MMV): 10 posts. 4. Mechanic Machine Tool Maintenance (MMTM): 08 posts. 7. Instrument Mechanic: 05 posts. 9. Auto Electrician: 02 posts. 10. Mechanic (Repair & Maintenance of Heavy Vehicles): 02 posts. 11. Draughtsman (Civil): 02 posts. 12. Draughtsman (Mechanic): 02 posts. 13. Computer Operator & Programming Assistant: 05 posts. 15. Laboratory Assistant (C.P): 05 posts. 16. Attendant Operator (C.P): 07 posts. 17. Advanced Attendant Operator (Process): 15 posts.